Vegie Bar, my favourite vegetarian restaurant in Melbourne, offers affordable mains under $20, generous serves, a variety of menu items inspired from Thai, Italian and Mediterranian flavours, raw food specialities, delicious cocktails and fresh juices, and a changing dessert selection to tempt even those with the strongest will-power. Vegan and gluten-friendly options available, including soy ice-cream and a gluten-free vegan chocolate mud cake that will have you heading straight for desserts. Open Monday-Friday: 11am – 10pm (Fri 10.30pm), Saturday-Sunday: 9am – 10pm (Sat 10.30pm). 380 Brunswick Street, Fitzroy. I have eaten at the Vegie Bar on many occasions, and have never been disappointed with any menu selection. Try it! Shakahari, located at 201-203 Faraday St, Carlton, is a cute little restaurant providing a warm, homely atmosphere. The food is 100% vegetarian, with menu options catering for other dietary restrictions: non-dairy, vegan, gluten-free, no onion or garlic. Menus are changed quarterly to take full advantage of seasonally available fruits and vegetables, offering innovative cuisine with inspiration from India, Japan, Thailand, and China. Generous portions, nutritious, and full of flavour, there are many items to tempt your palate. 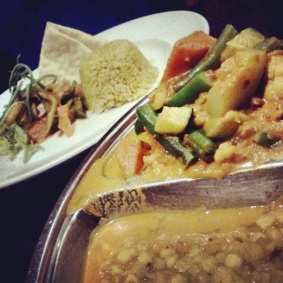 My recommendation Avocado Magic followed by the Indian Red Curry, pictured above. Open Monday-Friday: 12pm - 3pm and 6pm - 9.30pm, Saturday: 2pm - 3pm and 6pm - 10.30pm, Sunday: 6pm - 10.30pm. Shakaharitoo located at 225 Clarendon Street, South Melbourne, opens Tuesday-Saturday: 12pm - 3pm, Wednesday-Saturday 6pm - 10pm. For those on a budget, Lentil As Anything is a not for profit community organisation, proving delicious and nutritious food for the hungry. Based on values of trust, generosity and respect that gives people the opportunity to eat out and be social regardless of their financial situation, patrons pay what they are able, by placing money inside magic boxes (EFTPOS also available). In Melbourne, located at Abottsford Convent, St Kilda, Footscray, and Preston. Enjoy a delicious and hearty meal, relax and have a chat with a stranger, listen to busking musicians, and feel welcomed in a friendly community space. Open for lunch and dinner at all locations, and also for breakfast at Absottsford Convent. Crossways is another venue where one may eat a nutritious and wholesome vegetarian meal, with little expense. Owned and managed by Hare Krishna Melbourne, here you can meet new friends from all over the world. For as little as $5.50 (students, seniors, concession card holders) and $7.50 for others, one will leave with a full stomach and new friends after eating here. The two course lunch menu changes each day of the week, providing curries and satays from India, Thailand and Malaysia. Mains are vegetarian, vegan-friendly, wheat-free, and gluten-free. Open for lunch Monday – Saturday: 11.30am – 3.30pm, Level 1, 123 Swanston Street, Melbourne. On Monday, Wednesday and Thursday, from 6pm, join Urban Yoga for an 1.5hr power yoga class followed by a two course vegetarian dinner for under $20. Or head down the road to Crossways' sister restaurant,Gopals, 139 Swanston Street, for a la carte lunch and dinner, in a casual atmosphere. Open Monday - Thursday: 11:30 am - 9:00 pm; Friday:11:30 am - 9:30 pm; Saturday: 11:30 am - 9:00 pm. There are so many vegetarian options these days. Most restaurants will cater for vegetarians, and many more vegetarian restaurants popping up. Places like Smith and Daughters on Smith Street is fast becoming a destination because of it's great vibe and food, it just happens to be vegetarian. Also Trippy Taco, Enlightened Cuisine, Moroccan Soup Bar, Blue Buddha, Madame K, Gong De Lin, Invita and Lord of the Fries to name a few popular vegetarian restaurants in Melbourne.